Contemporary legal doctrine holds that corporate managers have obligations, first and foremost, to maximize profits for their shareholders. This doctrine is based on the assumption that shareholders alone bear the financial risks and contribute the equity necessary for production. But what if other groups contribute assets and also risk losing their investments? What if other groups actually shelter shareholders from financial risks? Such is the case with the nation's prime defense contractors. By examining the case of defense contracting, where the federal government and, indirectly, the taxpayers assume most of the risks and costs of producing weaponry, Rachel Weber critiques the assumptions underlying our system of corporate governance.The Department of Defense provides contracts for billions of dollars, specialized components and facilities, interest subsidies, tax breaks, and regulatory relief. These public contributions make the record shareholder returns and executive compensation packages of the early 1990s all the more problematic. This book follows the case of General Dynamics, the nation's largest military shipbuilder and considered a trendsetter in the industry for its explicit shareholder orientation. The behavior of contractors like General Dynamics in the post-Cold War period raises serious concerns about the private stewardship of public funds. How can the government make contractors accountable to other public interests? 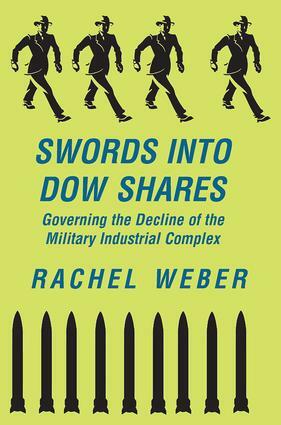 In Swords into Dow Shares Rachel Weber offers some original suggestions for redirecting defense resources to foster innovation, decrease the tax burden of military spending, and help to retain and create high-wage jobs in a civilian-industrial economy.